Baroness Catherine's display of garb. Some people wear styles from many different cultures and time periods. Others strictly adhere to the clothing that their "persona" would have worn. Still others will wear an Elizabethan gown to one event, a Norman tunic to the next, a Turkish belly-dancer garb to a hafla, et cetera. There's really room for everyone's interests. 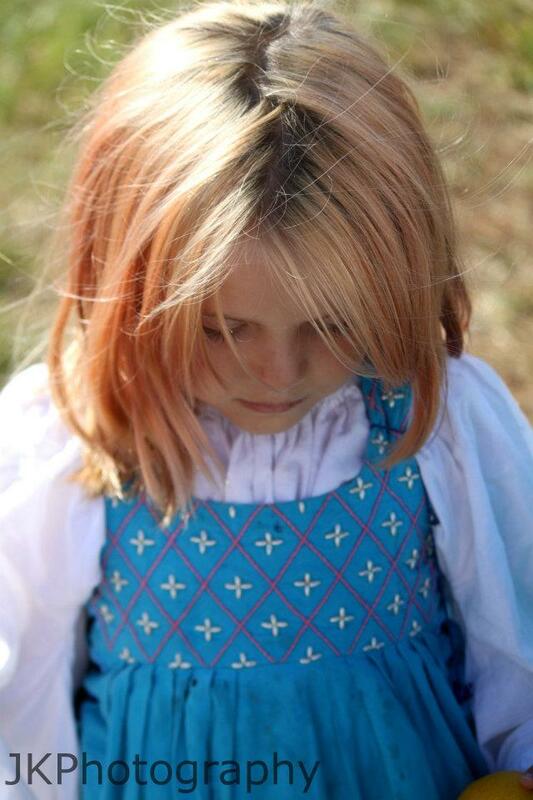 The terms costume and garb are often interchangeable. However, since we are trying to portray people of the past, it’s more likely that the term "garb" or "Period Clothing" will be used for the more accurate and authentic the garments. For those of us who seek to understand people of the past by quite literally wearing their shoes, replication of historic clothing to a high degree of historic accuracy is essential. But this is by far the minority and only enjoyed by those whose fun revolves around that eternal question "Whatever Shall I Wear?" 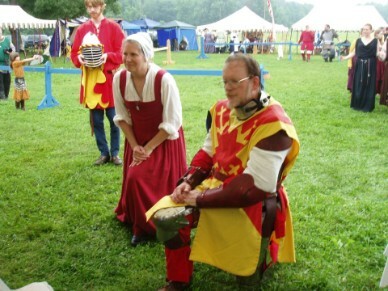 All in all, we're people to whom dressing up in funny clothes and playing medieval is our idea of a good time. At whatever level you play, enjoy! Lord Jean Maurice and Lord Ivaar in late period fencing attire. 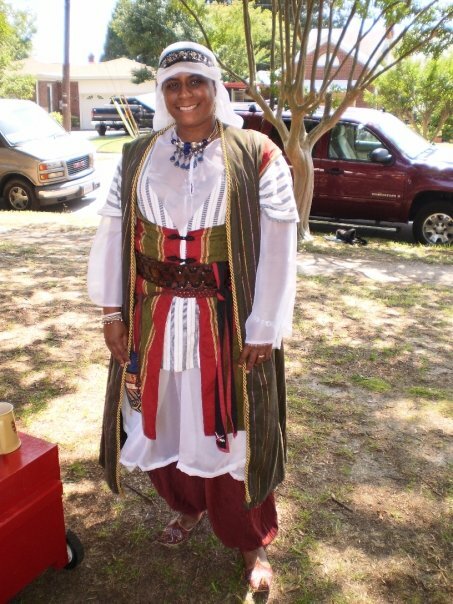 Lady Akila in middle eastern garb. What you wear is entirely up to you. 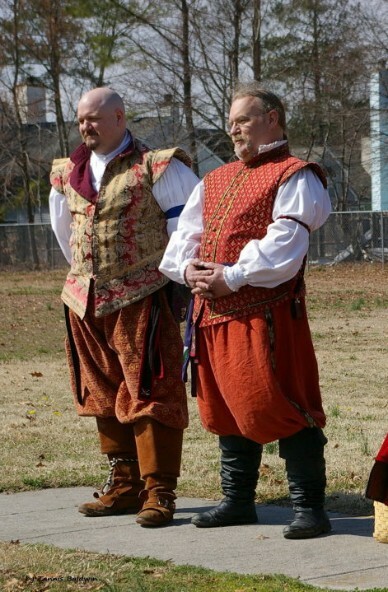 There is only one requirement for participation in the SCA: wear an attempt at pre-17th century clothing. 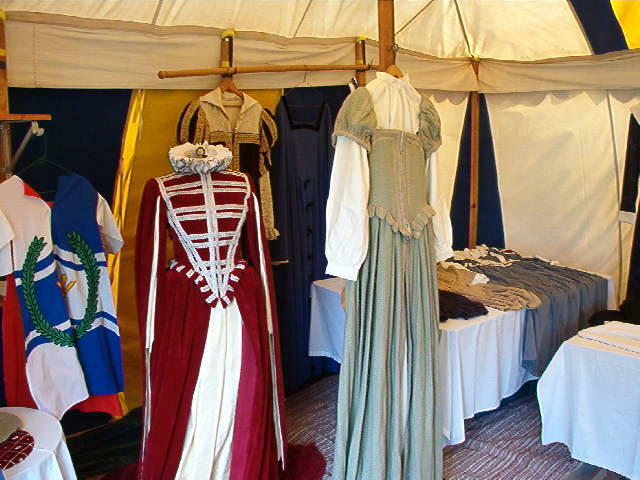 The focus of the SCA covers a wide range of years and cultures, and so does the variety of clothing people wear. Outfits are made or purchased. They can be made with period and modern materials. Some people choose to wear a simple belted tunic and baggy trousers. Others will go to great effort to achieve an authentic as possible appearance from head to toe. Most of us are somewhere in the middle. 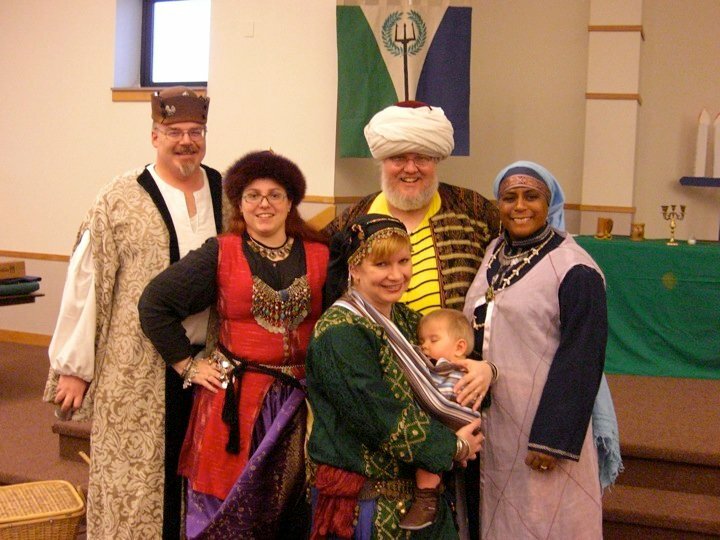 Baron Mike, Lady Catalina, Lady Analise with baby Brandon, Master Rabah and Lady Akila in middle eastern and Mongolian. Master Donal, Baroness Catherine, and their son Charlie. Jasmine in a hand beaded and embroidered dress.